Proud to be a Sikh - First Look! Here's a tantalizing first look at "Proud to be a Sikh" an upcoming drama by Satdeep Singh & Dr. Rupinder Singh. This is not Satdeep Singh's first film. He has already won awards for his films. You may remember Satdeep as the First Place winner of the 2011 SikhNet online Film Festival. His winning film was called "Born to Lead." In 2010, Satdeep Singh's film "The Forgotten Truth" also won in the intermediate division. The movie is based on the life of a Gursikh professor who comes to India with lots of aspirations and feelings for his heritage and culture, as he was forced to leave the country during 1984. 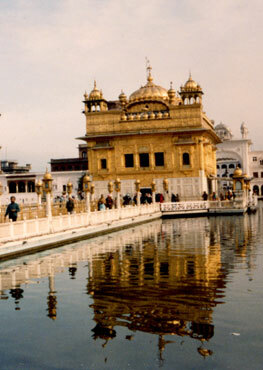 But as soon as he enters the city he comes across a very different environment and culture among the Sikh youth. Also few incidents occurred which left him in shock and made him to find out what that reason was which shook the roots of Sikhi for over 20 years; those roots which took more than 500 years for our Guru sahibaan and many Gursikhs to nurture and carry forwards. "Proud to be a Sikh" is about the journey of that Gursikh professor in making Sikh youngsters aware and feel proud for their identity and rich heritage , the difficulties he faced during this journey, and how he emerges victorious in the end. It is about clarifying the true image of a Sikh in the mind of society and not the one which they have projected in their minds based on false media propaganda and other misunderstandings. The hero displays the lifestyle of a true Khalsa in which he displays both the qualities of being a saint and sipahi (soldier) when each role is required by the circumstances. The movie is about two hours long and has four songs (two are rap songs.) Shooting was done in Ludhiana and nearby areas. Currently about 80% of the shoot has been completed and plans are to release it by the month of August this year. The lead character is played by Amritpal Singh Billa(a renowned Punjabi actor who has played roles in various Bollywood movies like Singh is King, Jab we Met, Love Aaj Kal, etc.). Other major cast members include Satish Kaul , Harvinder Singh, Rakinder Kaur, Harkirat Singh, Prince Chibuiseize, Tarlochan Singh, Sifat Sidhu and others. Check out this trailer and let us know what you think. Our Children Are Calling for Help. Can You Hear Them? Gurumustuk Singh Appointed new SikhNet C.E.O.